Written by Janet Choi on October 18, 2016 . Onboarding new customers is like teaching kids how to swim. You want everyone to be a future Olympian but have to start from scratch with how to blow bubbles in the kiddie pool first. The big problem with mastering a new skill is that the kiddie pool is frustrating when that’s not your primary goal. When you’re learning something new and you don’t have a lot of experience, it’s easy to get discouraged and give up. Wistia’s CEO Chris Savage says that the best way to encourage people to learn something new is to change the shape of the learning curve. The most important component of learning something new is setting small goals on the road to achieving a big one. By setting small goals, you can feel more joy and thus, motivation, even at a low experience level. 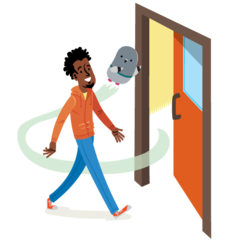 Instead of a slog, the onboarding experience should feel like barrier-free advancement. Onboarding is all about coaching users to achieve their goal, from the kiddie pool to swim floaties and beyond. Design and communicate a series of small wins to build and maintain motivation. Here’s how to get started. We all tend to approach motivation with the Big, Hairy, Audacious Goal in mind, whether we’re product-makers or consumers. It’s all about running the marathon, getting rich, learning French, nabbing the promotion rather than all the little steps in between. But as it turns out, the thing that motivates us most is small wins. For one, it boosts our mood. One study asked employees what affected their mood during their day. When they made progress towards a work-related goal, they felt happy. What’s particularly surprising was that in 28% of these instances, the mood-boosting step forward didn’t even majorly affect the progress of the project. We love to make progress, even if the win is not that important. That provides the motivational fuel to keep going. Getting customers to experience meaningful progress in your product requires their activity and engagement. That feels like a chicken-or-egg problem when they don’t even want to use the product yet! As CEO of Chameleon Pulkit Agrawal argues, you can’t assume that people want to learn how to use your product. At the very beginning of the product journey, provide smaller goals to get people a little more excited about figuring stuff out. When people sign up for online learning platform Codecademy, they have one big goal: learn how to code. But mastering a brand new subject is incredibly daunting. 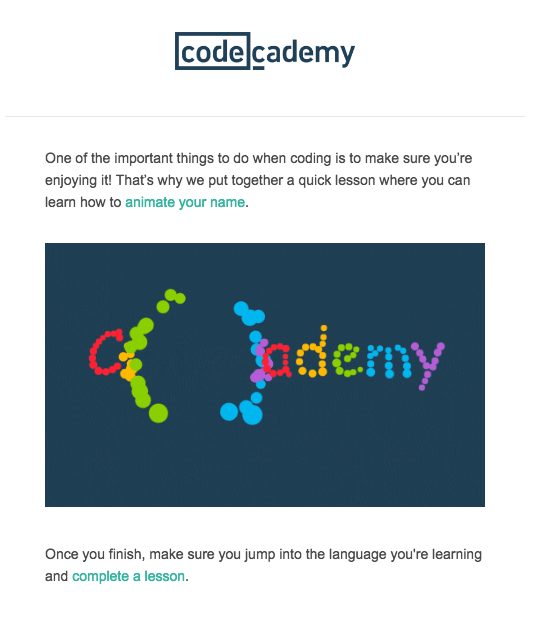 So Codecademy breaks up their onboarding process into smaller-scale goals with a quick lifecycle email. They provide a mini coding project to make it feel like you can actually complete something. By the end of this assignment, you’ll have a completed project that’s unique to you. It’s like an amuse-bouche to get you hungry for more. Sometimes, it just takes a little more encouragement to help people accomplish their small goals. One of the most powerful tools in your arsenal is showing people their progress. In one of Dan Ariely’s studies, students were paid to build Lego figurines called Bionicles. Every figurine they built earned a decreasing amount of money, and both groups were told that their Bionicles would be disassembled once they were done. In Group One, though, the participants watched as their completed figures were dismantled. Group Two, on the other hand, placed each completed toy on a desk like a trophy before continuing onto assembling the next one. Group Two built eleven, and Group One built seven. Seeing that visible accumulation of Bionicles drove Group Two to keep building. They did so even though they knew each completed figurine earned less and less money and would be undone. The progress meter is a common tactic in products and apps, whether it’s measuring the completion of a profile for a social site or encouraging the next step in an online course. Knowing where you stand in a process or reaching a goal is motivating because you can see how much you have left to go. Songkick helps you keep track of when your favorite artists go on tour near you. But for you to get any value from their service, they need to know which musicians you like. Otherwise, you’d never get a concert alert and Songkick would never have a chance to prove itself. 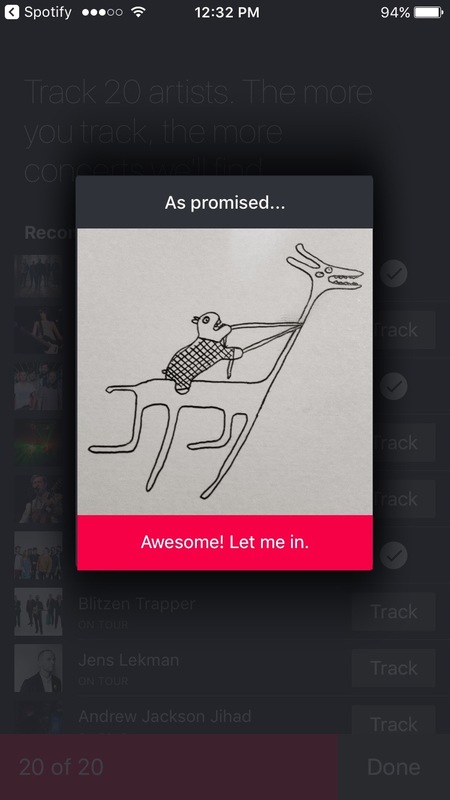 So here’s what happens in their mobile app onboarding: Songkick wants you to choose 20 artists to track, but if you stop before you reach 20 in the setup phase, you get this notification: There’s a bar at the bottom of the screen that indicates your progress as you scroll through their recommended artists. But they also don’t give up too easily on the less motivated folks like me who clicked “Done” after choosing 5. They keep up the encouragement with an offbeat mini-incentive to finish the task. This is truly a small win from the user’s perspective. 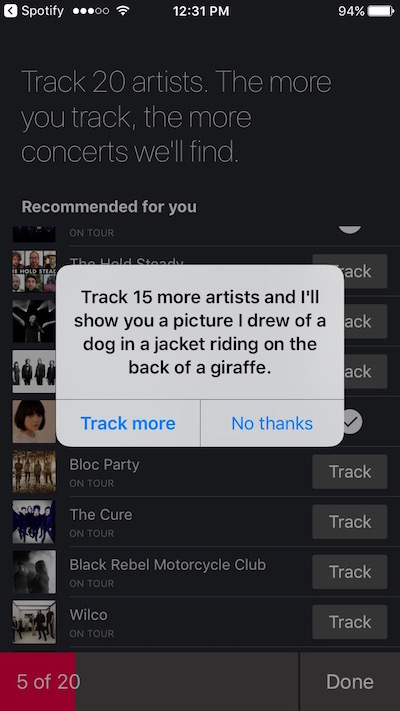 But it’s a fun way to get a little more invested in the app and brand that pays off to reach the larger goal of keeping up with concerts better. Positive reinforcement for small wins is an effective strategy for many kinds of behavior modification, from dog training to classroom management to motivating employees in the office. But it’s especially effective when people are just starting something new, as there’s so much inertia to overcome. One study examined different ways of motivating people to donate to a charity called Compassion Korea. In an email marketing campaign, researchers sent out two emails to people who’d just completed a donation. One email said that they were halfway towards their fundraising goal, and the other version said that half the money still hadn’t been raised. Both campaigns raised the same amount of money by soliciting this second round—but from different kinds of donors. New donors, that is, people who had only donated to Compassion Korea once or twice before, were much more likely to respond positively to the “glass-half-full approach”. As the researchers noted, “Novices feel uncertain about their level of commitment… and increase their efforts in response to success (versus failure) feedback.” Newbies need positive feedback, more so than old hats. 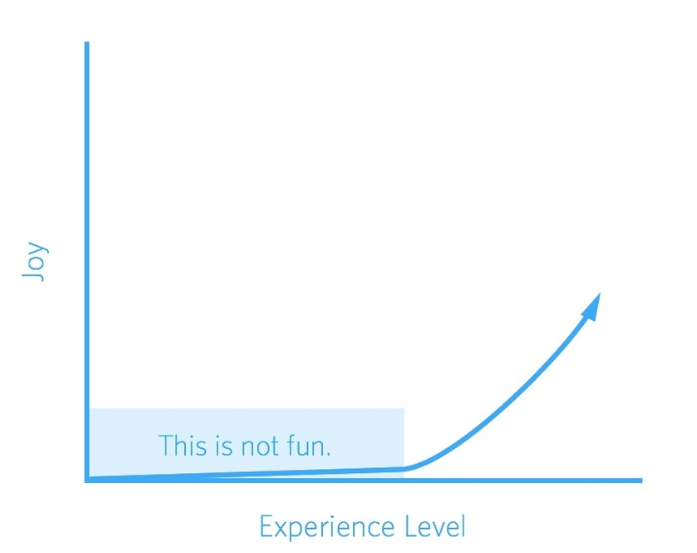 This applies to your onboarding. Your feedback needs to be encouraging and positive to drive further engagement, especially in the early stages. AddThis sends customers an email to notify them when something good happens, like a spike in traffic or shares on their site. It’s a simple message that provides not only a positive psychological boost for the reader but also a valuable alert. 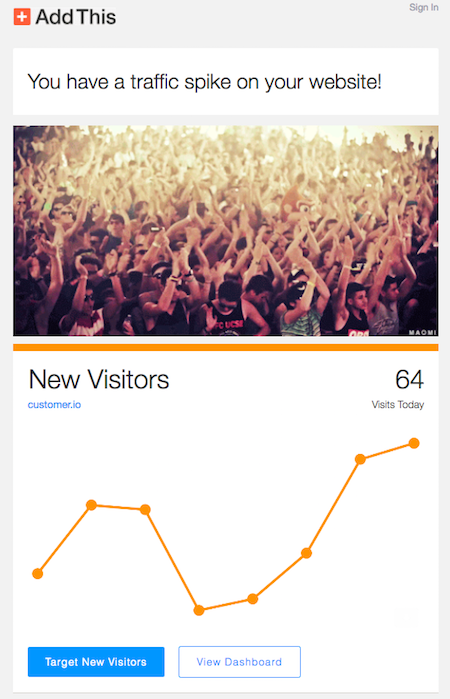 AddThis knows that their customers’ big, hairy goal is to grow their audiences and celebrating a small win like a spike in new visitors helps you feel like you’re moving forward. Consider designing and orchestrating some of these small wins as part of the initial onboarding experience. Your small wins aren’t necessarily the same as your customers’ — and that’s one of the most important principles to remember when designing the user onboarding experience. You want to drive engagement, get people to keep using the app, or elicit referrals and invitations, but the odds very much are that there aren’t your users’ goals. 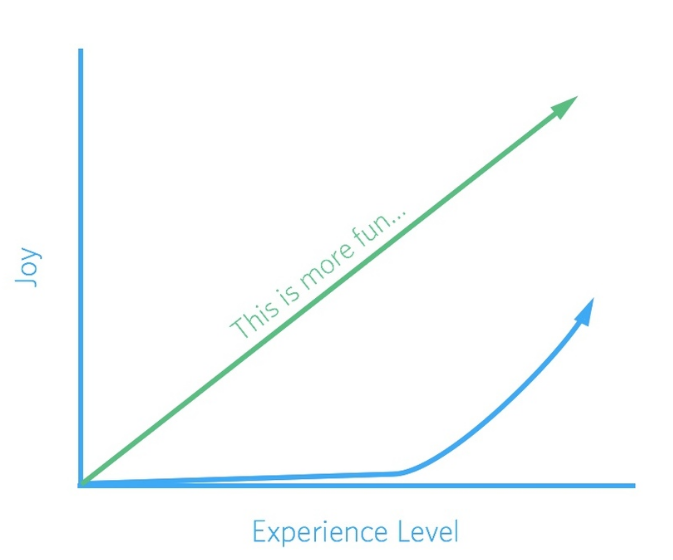 The user’s goal is to experience some real-world value. You can’t motivate people to achieve even the smallest of goals unless you think about it from their perspective. Inch by inch, their small goals will make a big difference. Check out our webinar on demand where we shared 6 ideas to make your onboarding sing … and maybe a funny drawing too.